Fill your home with the mellow and calming scents of freshly-ripened pear and fragrant purple lavender, finished with the crisp, uplifting tang of orange. Our Pear, Orange & Lavender Diffuser gently delivers these soft and comforting scents to your home, so you can enjoy the stress relieving properties of these carefully-selected essential oils. Lavender has been used in cosmetic, fragrance and medicinal products for thousands of years, its distinct, calming aroma and naturally-derived essential oils offering a wealth of health and wellbeing benefits. The aroma of this sweet, lilac-coloured flower alone is intensely soothing, making it the perfect base note for our luxury Aromatherapy reed diffusers. 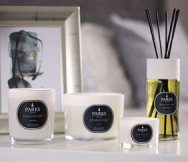 To complement the calming scent of lavender, we chose ripened pear, whose soft notes of fruit and earth work to heighten the mellow warmth of the aroma. Imagine walking in a fruit orchard at sunset, with the scent of lavender blowing from an adjacent meadow, and you’re close to the scent delivered by this charming and luxurious rattan stick diffuser. Lifting and balancing the fragrance is natural orange zest, and we’ve been careful not to add too much to impact the calming potency of the aroma. The added note of orange works to brighten the scent, making it more invigorating and refreshing, for a clean and calming fragrance, whatever the room. Luxuriously wrapped in a presentation gift box, the Pear, Orange & Lavender Diffuser would make the ideal gift, or a luxurious treat for your home.